Yesterday, you may have noticed news stories on All Things Digital and CNET that alluded to a new HubPages advertising program. Before that, some of you noticed changes in our Terms of Service that alluded to that very same change. Why did we not officially announce something on the site until now? It was a bit of a secret program until now! We wanted to give these reporters a scoop on the story, and it’s not really a scoop if we’ve already spilled the beans on our site. But at long last, we can say it loud and clear: HubPages is launching an entirely new channel through which you can earn an income on the site: the HubPages Ad Program! We are introducing this option to make it possible for you to earn as much as possible by offering an optimized mix of premium ads from multiple ad partners that will run alongside the Google AdSense ads on your Hubs, as well as any Amazon or eBay capsules you use. You might be wondering how the HubPages Ad Program will impact your earnings from HubPages. To give you an idea of its effectiveness, nine beta tester Hubbers who had the program turned on for their accounts in January and February experienced an average earnings increase of over 50%! Not bad, huh? You’re probably wondering how you can activate the HubPages Ad Program on your own account. As the program is new, we are inviting Hubbers to use it in waves, with the first wave of invites going out tomorrow, March 3rd. If all goes according to plan, the HubPages Ad Program will be available to all Hubbers by June of this year. Once you are invited to become a part of the HubPages Ad Program, you will have a choice to opt in or keep things the way they are. Once you have opted in to the program, your earnings through the program can begin! Payment is through PayPal, and your first payout will take place once you’ve reached a $50 payment threshold. Whether you choose to use it or not, the HubPages Ad Program was created by HubPages to make your experience as an online author better than ever. We hope you enjoy it! 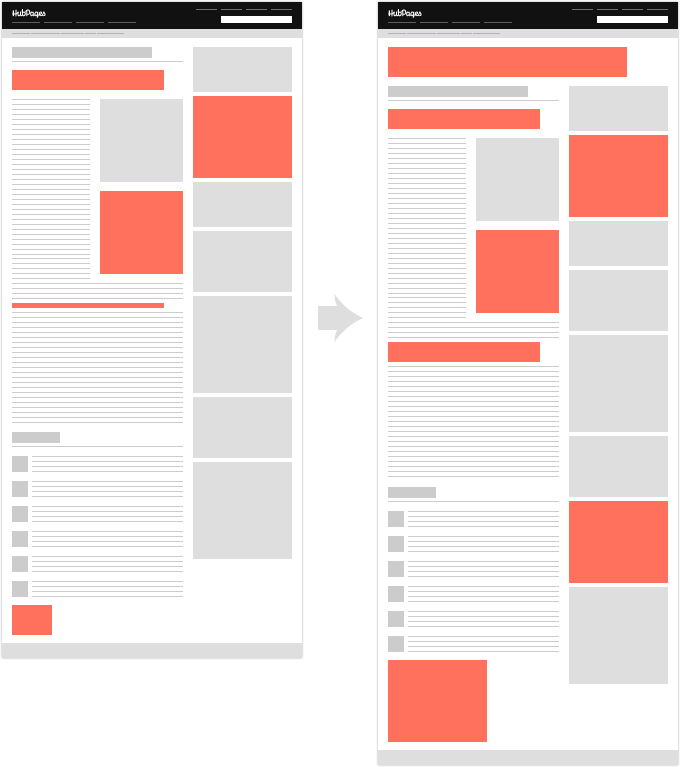 The traditional ad format looks like the layout to the left; the HubPages Ad Program format looks like the layout to the right. The HubPages Ad Program adds additional revenue-generating spots on your Hub. Invitations will be sent out in waves to Hubbers – there will be a bit of randomness involved, but a priority will be given to those who are active on the site. We are simply trying to bring this major program to scale gradually, to make sure that everything works perfectly. You must have a valid AdSense account to qualify for the HubPages Ad Program. They are designed to be complimentary. The other affiliate programs already available on HubPages (e.g. Amazon, etc.) work along with the HubPages Ad Program. You must have a valid PayPal account in order to receive payments from the HubPages Ad Program. For more information, check out our Learning Center guide to the HubPages Ad Program. To ask questions and discuss the HubPages Ad Program with the HubPages community, visit the official forum thread. Nice idea, and about time, too! But seriously, would you ever consider offering payout via cheque as an option somewhere down the road, especially for us overseas folks? So excited about this. Looking forward to when it rolls out in June. Have been following this new development. Great News! Can’t wait to be in. I’m hope to get the invite my favorite HubPages…Still awake! cool1 When do we start! Nice idea, and about time, too!But seriously, would you ever consider offering payout via cheque as an option somewhere down the road, especially for us overseas folks? Now lets get hold of the new ad layouts! Looking forward to this since my adsense account got disabled because I used traffic exchanges on my blog without realizing I couldn’t do that. Really looking forward to being part of the next wave. Tell us more about it. Just activated my Hubpages Ads Program. I am in now. Can’t wait to how earnings will go. Thanks for another way of earning income on Hubpages. This sounds impressive. From what I have read it seems like there is no where to go but up in earnings. I look forward to being invited. Great stuff! Hugpages is growing from strength to strength. !Woo ….oo.” Bring it on! Wow! This is really a great news and a reward for hubbers to get the benefits of premium ads. Hats off to HubPages! Looking forward to become a part of it. Wow, this sounds great. I loved HubPages before, just another great reason they’re the best in my book. This is a great news. If anybody was having hard time believing Hubpages would sort out the Big G update, now it should be evident for everyone that HP is serious about growing their business. Nobody can stop Hubpages! You guys are the best! Love it, great Idea..please count me in!! Just went to my affiliate program menu. Hubpage Ad Program is avaible but it states there I’m not currently eligible to particate on the program. What does it mean? Finally, i now know ‘what’s been cooking’. This is good news HP. The fact that you keep thinking and working out ways for us hubbers to achieve AND NOW earn more is awesome and highly commendable. I’m glad to be a part of this great and forward looking site. I’ve been thinking about concentrating more of my writing on HubPages because I enjoy the community. This program gives me even more reason to write more for HubPages. It sounds very exciting. This sounds absolutely great! I can hardly wait to get my invitation! Thank you so much Hub Pages! Welcome! But Idon’t have ann adsense account. Cain I join this programme ? I am eagerly looking forward to the new Hubpages Ad Program. Looking forward to this – and receiving my invitation. @ Reneel (a few comments up) this HubPages blog post indicates that you will receive an invitation, between 3 March and June. I’ve activated mine a few days ago and I am so happy with the program. Hubpages, you are so cool! Thanks so much! Can’t wait for it to be my turn to get it! guess i wont be in because im still having troubles with my adsense account. Im realy at my wits end with adsense! Count me in. I’ll believe it when I see it, but I’ll stick around to see it, that’s for sure. So far, “the hub” is lookin’ good. This sounds amazing, I hope one day I will be asked and accepted. I already have hub pages ads program running on my hubs and earnings so far is great. Thanks Jeff! I’ve fixed the link.